Credit: NASA/CXC/UMass Amherst/Q.D.Wang et al. The center of the Milky Way is a crowded neighborhood and not always a calm one, according to the latest image from NASA's Chandra X-ray Observatory. In addition to the supermassive black hole at the center, the area is filled with all sorts of different inhabitants that affect and influence one another. 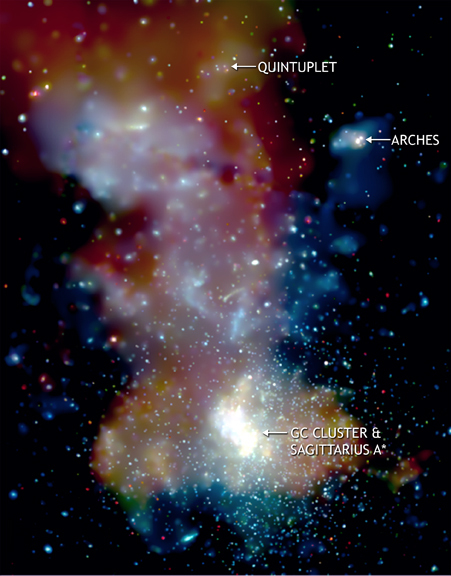 The new X-ray image shows three massive star clusters, the Arches (upper right), Quintuplet (upper center), and the GC star cluster (bottom center), which is near the enormous black hole known as Sagittarius A*. The massive stars in these clusters can themselves be very bright, point-like X-ray sources, when winds blowing off their surfaces collide with winds from an orbiting companion star. The stars in these clusters also release vast amounts of energy when they reach the ends of their lives and explode as supernovas, which, in turn, heat the material between the stars. The stars near the Galactic Center also can emit X-rays as stellar corpses -- either in the form of neutron stars or black holes in binary systems -- and are also seen as point-like sources in the Chandra image. While the individual stars in these clusters are experiencing their own hectic lives, the clusters themselves are also busy interacting with other residents of the Galactic center neighborhood. For instance, the star clusters are slamming into cooler, dense clouds of molecular gas. These powerful collisions between the clusters and clouds may result in a higher proportion of more massive stars than low-mass ones in the Galactic center, compared to a quieter neighborhood. The collisions may also explain some of the diffuse X-ray emission seen in the Chandra image. Over the course of several years, over two million seconds of Chandra observing time has been devoted to studying the center of the Galaxy. This latest image from Chandra represents more than 1 million seconds of time and covers the area of 168 by 130 light years across. In this image, red, green, and blue correspond to lower, medium, and high-energy X-rays respectively. Credit NASA/CXC/UMass Amherst/Q.D.Wang et al. Coordinates (J2000) RA 17h 45m 50.30s | Dec -28° 49' 20.00"
Q. Daniel Wang, 2006, The Interplay between Star Formation and the Nuclear Environment of our Galaxy: Deep X-ray Observations of the Galactic Center Arches and Quintuplet Clusters (astro-ph/0606282).